One of the most common uses of task runners is to concatenate, minify and uglify files. For our example, we will look at a basic setup for compiling Sass stylesheets to a single CSS file, then we'll minify the result. This will install Gulp and add it as a dependency to your package.json (thanks --save-dev flag! ), making it really easy to get this all up and running on other machines. You need to install any package you require in your Gulpfile. Let's get our first Gulpfile ready to watch for changes to our Sass files for changes then transpile and concatenate them. // any other watchers you want to add go here! Note: You can install all of these packages at once using the command npm install --save-dev gulp-sass gulp-rename gulp-concat gulp-minify-css. This Gulpfile has two watchers bundled into its default task. The first watcher will watch the SCSS directory (and it's subdirectories) for changes in any file ending ending in .scss, then it will run the sass task. The sass task will then concatenate and transpile the sass to CSS, name this output file style.css and place it in the css directory. The second watcher is for the css directory, watching for changes in the style.css file. When there is a change it will concatenate the file (doesn't do anything in this example), minify the file and then output the file to the directory dist/css. 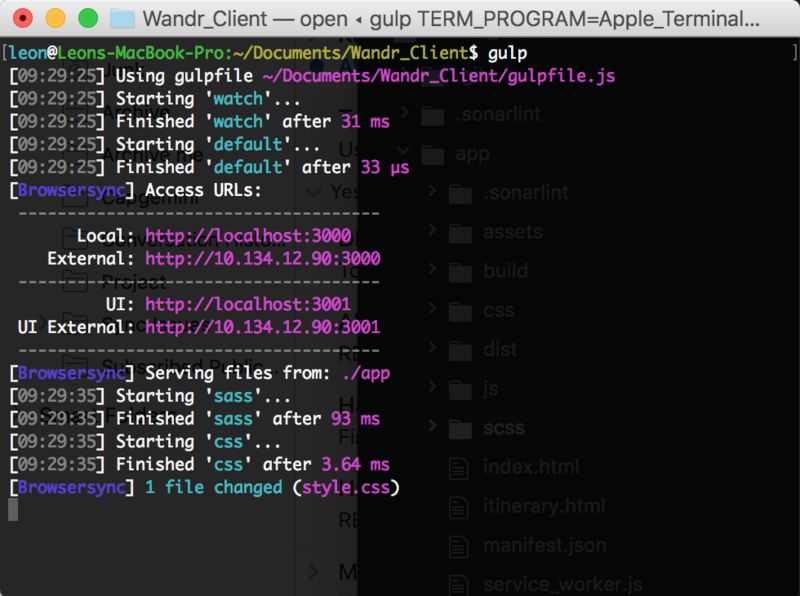 Run the Gulpfile by navigating to the root directory of your project and running the command gulp. 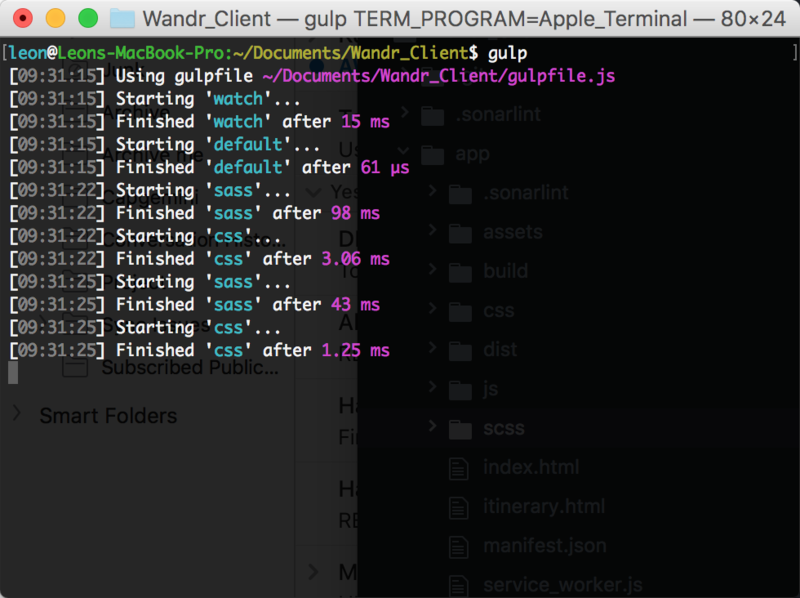 This will run gulp default, which in our example is a task that runs gulp watch. Now you have a minified CSS file built from all your SCSS files! I use the BrowserSync package to update my website's resources in real-time, without the need to refresh. An added benefit of using BrowserSync is that it automatically runs a local version of your website, including an external link. Super useful for testing on different devices without a metric ton of setup! The first thing you need to do is add the dependency to your Gulpfile (and install the package, adding it to your package.json!) by adding the following line: let browserSync = require('browser-sync').create();. Finally we need to make sure that when we change our resources, the change is streamed to BrowserSync. To do this we need to add a line to our css task (after we set the file destination), the following line will signify to BrowserSync that there's been a change in a file: .pipe(browserSync.stream());. Now when we run gulp, not only do we get a local server running the site (and an external link!). We also get live reloads/updates when we change our SCSS files.